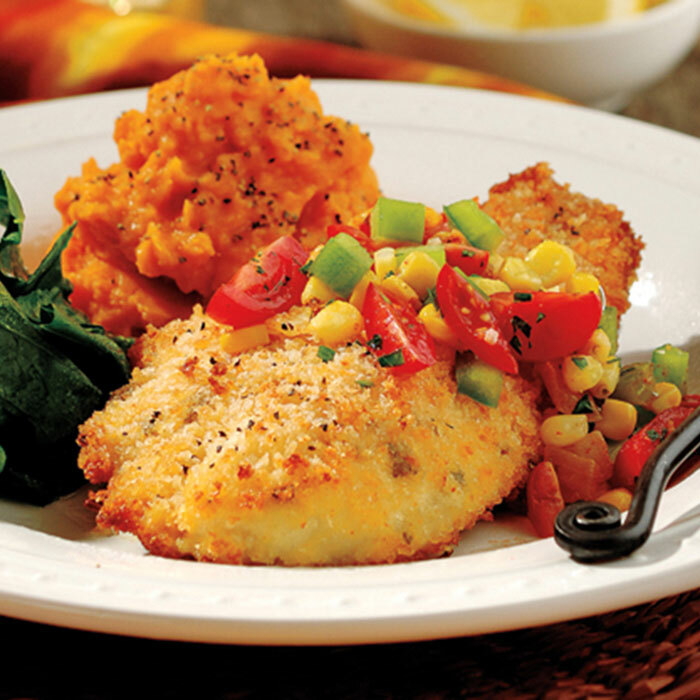 Add a little Mardi Gras flavor to your dinner plate with this spicy Cajun catfish! ¾ teaspoon Cajun seasoning and mustard. In separate small bowl, combine breadcrumbs with Parmesan. Spray 13 x 9-inch glass or metal baking dish with nonstick cooking spray. Arrange catfish in baking dish. Spread mayonnaise mixture evenly over filets, then sprinkle with panko mixture, patting lightly so panko adheres. Bake 25 minutes or until catfish turns opaque throughout and reaches an internal temperature of 145°. Meanwhile, prepare Tomato-Corn Relish: In large skillet, heat oil over medium-high heat. Add celery, onion, and bell pepper, and cook 3 minutes, stirring occasionally. Stir in corn, tomatoes, and remaining 2-¼ teaspoons Cajun seasoning, and cook 2 to 3 minutes or until vegetables are tender and heated through, stirring frequently. Remove skillet from heat. Stir in remaining 2 teaspoons parsley and hot sauce. Top catfish with relish to serve.